Last weekend, I was thinking of one of Spurgeon's sermons, called God’s Providence. (#3114). Spurgeon likened the cherubim’s acts near the throne and the wheels within wheels as described by Ezekiel as machinery of Providence. He described, hypothetically of course, the wheels going up and down and left and right in tandem as the machinery of Providence carrying out God’s will and decrees. It’s an interesting thought, and Spurgeon is vivid about his descriptions. Please enjoy this scripture photo I made of the machinery of prayer. Under that will be some further resources on prayer suggestions. Monday I suggested praying for the persecuted and missionaries around the world, with some resources to check out along those lines. Tuesday I suggested praying for our elders (pastors, deacons, teachers, etc), again, with resources. Wednesday I suggested praying for each other. Today focuses on how often to pray. Thursday I offered information about frequency of prayer. Friday we focused on Jesus in heaven who hears our prayers, and what a comfort that is. For this next-to-last picture in the series, I'll offer some thoughts and resources on persevering in prayer. I thought Barnes' Notes said it well. There are different kinds of prayers and seasons for each kind. There are different attitudes of prayer. Always - At all times. That is, we must not neglect regular stated seasons of prayer; we must seize on occasions of remarkable providences as afflictions or signal blessings to seek God in prayer; we must "always" maintain a spirit of prayer, or be in a proper frame to lift up our hearts to God for his blessing, and we must not grow weary though our prayer seems not to be answered. Not to faint - Not to grow weary or give over. The parable is designed to teach us that, though our prayers should long appear to be unanswered, we should persevere, and not grow weary in supplication to God. It is well said that neglected prayer is the birthplace of all evil. I believe this. Jesus spent time instructing the disciples how to pray. (Luke 11:1-13). 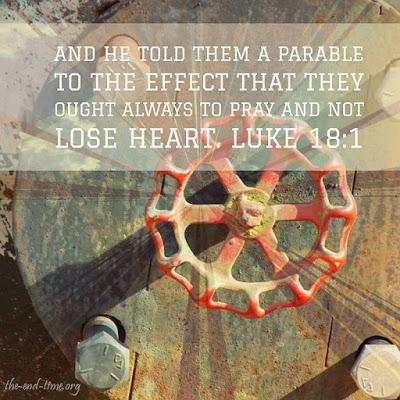 He spent time instructing through the parable of the importance of persisting in prayer. (Luke 18:1-8). Prayer is important. I need to do better in lots of ways- in my closet, in persisting, in focus, in content, and in earnestness and fervor. Lord, help me to pray.